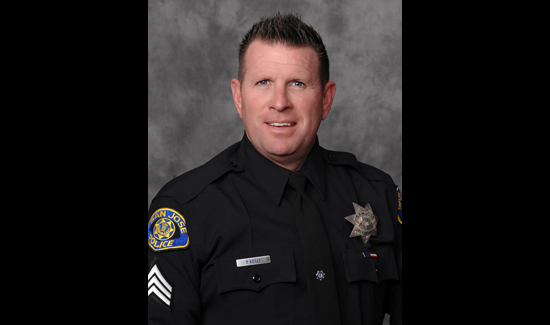 Ed Note: The authors of this opinion piece are Paul Kelly, president of the San Jose Police Officers Association, and James Gonzales, vice president of the San Jose Police Officers Association. It originally appeared in the San Jose Mercury News. It has been a gut-wrenching two weeks for the men and women of the San Jose Police Department. On the night of March 24, Officer Michael Johnson was taken from us, doing the job he loved. He gave his life keeping our community safe. From the despair of that evening, our department pulled itself through. We cried together, and we leaned on each other for support. We took enormous pride in the memorial service that saw thousands honor the ultimate sacrifice Michael made. And we continue to be touched by the incredible outpouring of support shown to Michael’s family by the greater San Jose community throughout these very dark days. Officer Johnson’s memorial brought hundreds of former San Jose police officers back to the city to honor our fallen brother. For one day, the San Jose Police Department was whole again. But it was fleeting. Hours after Michael was laid to rest, all those departed officers returned to their new departments. The San Jose Police Officers’ Association now turns to the business of trying to resolve what led those officers to leave. Yesterday, we, along with the San Jose Fire Fighters met with the City to begin to replace Measure B, end litigation, legally reduce pension costs to restore services and turn our city around. Our goal is to make San Jose an employer of choice at an affordable cost. As we consider how to replace the decades of experience the police department lost, we must confront the reality of what caused these officers to leave. As ill conceived as Measure B was, the vilification of our officers and the Chuck Reed brand of reform that accompanied it broke the bond our officers had with the city. We are reminded of the day in 2010 when Chuck Reed stood in front of our officers and accused them of being on the “gravy train.” When asked if his comment was meant to extend to the 11 brave men who at that time had given their lives protecting our community, Reed had no answer. We are confident that the thousands of residents who attended Thursday’s memorial service and lined our city’s streets and mourned with us now reject Chuck Reed’s approach. This was the real San Jose, the San Jose we must get back to; and not just for one day. That will take leadership and compromise on all sides. San Jose needs leaders willing to stand up for what is right and decent and willing to strive to bring people together. Unfortunately, in San Jose’s recent history, too many, including the Mercury News along with former mayors and current and former city councilmembers, failed to question and fully grasp the negative outcomes of the city’s visceral pursuit of pension reform at any cost. Our city suffered because of that lack of leadership and unwillingness to compromise. The murder of Officer Michael Johnson will be with us forever, but so will his even keel, his good humor and his decency as a human being. We will honor Michael and all those who wear the San Jose uniform by doing our best to heal the wounds that have been festering for years and begin to move our city forward. We hope the new makeup of our city leadership will ensure a willing partner in this endeavor, so that together we can begin to repair what has been broken. San Jose Police Department brave men and women have always been recognized as one of the most professional police departments in the US.